FOR IMMEDIATE RELEASE – (Ottawa, Ontario) December 6, 2018 – For the first time ever, economics from an Indigenous worldview is being reclaimed within modern economic space. The narrative of growing Indigenous business success is expected to sky rocket over the next decade. A new multi-billion dollar agenda is on the horizon and the First Peoples of this land are the drivers of partnerships, investment and long term growth. Through a shift in legal influence, today Indigenous peoples own masses of land and entitlements through Treaties and Aboriginal Right and Title and operate space in all areas of business, industries and the private sectors. This will impact and inform important public policy and evolve Indigenous governance structures. With this growth, Indigenous Peoples are increasingly leaving their economic footprint on todays national economic landscape. As a partner organization, “The Canadian Council for Aboriginal Business is contributing to the push towards a $100 billion Indigenous economy in Canada, through our #supplychange initiative. We are actively working to raise Government and corporate procurement of Indigenous businesses to five percent via our Aboriginal Procurement Marketplace. If all levels of government in Canada were to procure five percent of their current $224 billion spend from Indigenous businesses, this would equate to an $11 billion influx to the Indigenous economy. On the corporate side, five percent of procurement contracts would translate into $23.6 billion. This is an opportunity to create prosperity and independence for Indigenous peoples across Canada without spending an additional dollar,” said JP Gladu, CEO and President of CCAB. Partnering with the Indigenomics Institute, “The National Aboriginal Trust Officers Association is honoured to be involved with the Indigenomics Institute’s $100 Billion Economy Agenda. NATOA believes that the economic impact our communities hold as shareholders in corporate Canada, is largely yet untapped and waiting to be awakened. 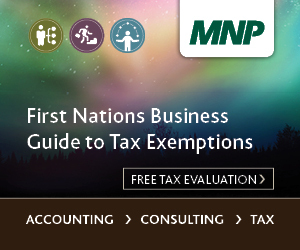 Encouraging free, prior and informed consent, partnership development and working with Indigenous communities, we can work with Corporate Canada to achieve the goal of a $100 Billion Indigenous Economy on this land, for the benefit of all Canadians,” said Mark Sevestre, President of the National Aboriginal Trust Officers Association.